The Anchor In continues to offer jazz every Friday, pairing guitarist Frank Singer with outstanding regional musicians. Nick "Tito" Ronzitti often provides rhythm support. Saturday performances feature an amalgam of blues, world and jazz -- again featuring regional artists. The Anchor In has expanded live music to Saturday nights with more Blues, Latin and cool!! Full dinner menu and music 6 til 9 on Friday, 6 til 9 on Saturday. Every time you get people through the door, you want to wow them,” says Ryan Newara, owner of Erie’s newest jazz club, the Anchor In. 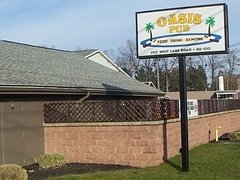 The club occupies the lower level of the Oasis Pub at 3122 W. Lake Rd., and has a capacity of about 100. Here's a sample of what you may hear: Tim Clarke, Buffalo-based trumpeter and Erie guitar wizard Frank Singer deliver on "All The Things You Are" (Aug. 30, 2013). “When I purchased the Oasis six years ago, the basement level was full of odds and ends, a place to store stuff. I’s been thinking about what we could do there, and began serious renovation within the past year". Top-to-bottom work was done by Ryan and partner Chrissie. (“I’m the contractor; she’s the decorator”) over a six-month period, including sound insulation to separate downstairs performances from upstairs rock/pop band sounds. “We wanted a non-smoking, lounge feel.. The bands are smaller, duos and trios, and the atmosphere is more intimate". While renovations were underway, Ryan was approached by local jazz artist/entrepreneur Joe Dorris, who lives across the street. Joe offered to line up weekly jazz and blues music for the club—an idea that Ryan and Chrissie had already considered. 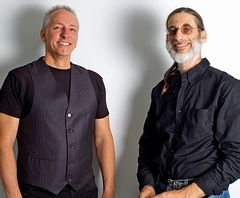 Their ideas meshed, and a Friday concert series was born, beginning in October, 2012. "We have added regular Saturday performances to broaden our appeal, with a variety of blues, Latin and jazz-oriented performers, including monthly jam sessions open to interested musicians." "We're always open to hearing people's ideas about what we're doing. We're heading into the fall with the intention of continuing our present lineups, and adapting as we go." “I’ve been interested in the restaurant business my whole life. I graduated from the Hotel & Restaurant program at Mercyhurst iFor n 1991, then was placed in Hilton Head, S.C. (!) for my internship. I like the fast pace, the people". Newara was repairing the Lounge’s outdoor electrical sign when I arrived for the interview. “You never know what may need to be done. I’ve done a lot of contracting work, so I can do renovations and repairs myself". 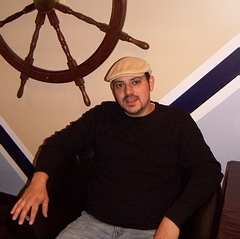 What’s it like to be a club owner in Erie these days? “Good, if you know what you’re doing. It depends on how hard you work at it; what you put in". For more information about upcoming shows, or to schedule a party or reception, contact Ryan at: oasispub3122@yahoo.com or call 833-1212.